If you choose to get married in a Church of England church, there is an added dimension - the assurance that God cares about your relationship and that his resources and strength are available to help you. Including God in your marriage doesn’t mean that you will avoid all the usual ups and downs, but you will know that you can look to God for help and guidance, and that his love will sustain you. You will also have the support and encouragement of the wider Christian Church family. Marriage, the Bible tells us, is a gift of God in creation and a means of his grace, a holy mystery in which man and woman become one flesh. It is God's purpose that, as husband and wife give themselves to each other in love throughout their lives, they are united in that love, just as Christ is united in love with his Church. 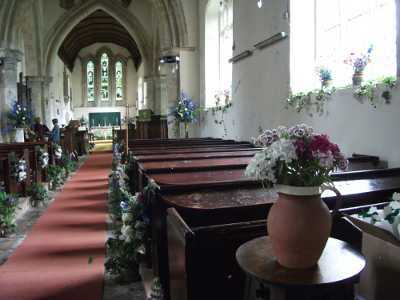 Having decided you want a church wedding, the first thing to do is to make an appointment to see the Rector. As the established church, the Church of England gives everyone, with no former partner still living, the right to get married in their or their partner's parish church. If you currently live outside one of our parishes, it may still be possible to get married in one of our churches if one of you has what is called a 'qualifying connection'; but you may have to apply for a Special Licence from the Archbishop of Canterbury’s Office or join the electoral roll of the church, which means attending the church regularly for at least six months. Q Where can I get married? • had his or her confirmation entered in a church register book of a church or chapel in the parish. • has at any time had his or her usual place of residence in the parish for at least 6 months. • has at any time habitually attended public worship in the parish for at least 6 months. • had his or her usual place of residence in the parish for at least 6 months. • habitually attended public worship in the parish for at least 6 months. In all these cases/In all cases involving church services - i.e. coming to/going to/attending normal church services, baptism, confirmation or marriage - this applies only to Church of England services. Under certain exceptional circumstances a special licence can be granted to allow the marriage in another church. To be married by special licence, at least one of you must have been baptised. At the moment you can only have a Church of England wedding in a parish church or some other place of worship - normally one licensed by the Bishop. It is not normally possible to have your church wedding in other venues, for instance in a hotel. Q How do I know which is my local parish church? A This will usually, but not always, be the one nearest to you. If you are not sure, do give the Rector a ring. Q How do I book the church? A As soon as you have decided you would like to get married in church, get in touch with the Rector to see whether the church is free on your preferred date. Book early to ensure you get the date and time you want. Venues for wedding receptions also book up early, so you would do well to book both at the same time. Couples are expected to prepare carefully for their new life together. One of the clergy will want to meet you in person to talk about marriage and you will be invited to a marriage preparation day which usually takes place with other couples also getting married in our group of churches. Q Can I get married on any day of the week? A Strictly speaking, yes, on any day except Christmas Day or Good Friday. However, it would not be easy to fit a wedding in on a Sunday. Q Can I get married at any time of day? A Not quite: there are some restrictions. Weddings may take place between 8.00 am and 6.00 pm. Q What are the legal requirements? A The normal preliminary to getting married in the Church of England is by banns. You must have your banns read out in church for three Sundays during the three months before the wedding. This is often done over three consecutive Sundays but does not have to be. Banns are an announcement of your intention to marry and a chance for anyone to put forward a reason why the marriage may not lawfully take place. Banns need to be read in the parish where each of you lives as well as at the church in which you are to be married if that is another parish. We ask couples to come and hear their banns. If you have a special licence, banns will be unnecessary. The clergy will discuss with you what you need to do. If you are under the age of eighteen, you must have your parents’ consent to marry. Q What if one of us is divorced? A The marriage service makes it clear that marriage is for life; 'till death us do part'. Sadly, some couples find it difficult to maintain their relationship for better or worse and marriages do break down. The church still has a loving concern for those who have tried and failed, and honestly want to try again. There are special guidelines on church marriage if you have been divorced. The best thing to do in these circumstances is to make an appointment to speak to the Rector; and she will want to talk to you frankly about the past, your hopes for the future and your understanding of marriage. If it is not possible for your proposed marriage to take place in church, she may consider other alternatives with you, such as a Service of Prayer and Dedication after a civil ceremony. A form and explanatory statement, 'Marriage in church after divorce', is available or can be ordered from Church House Bookshop, phone 020 7898 1300. A The costs of a church wedding are not high. The service itself costs less than most wedding dresses. The legal fees for a marriage cover the publication of the banns, certificate of banns (if necessary), the marriage service and a certificate of marriage. The Church Commissioners publish a Table of Fees each year. You can find this on the Church of England and Diocese of Ely Website. Fees usually increase annually on 1st January each year, so please allow for an increase if you are planning a wedding for next year. For 2018 weddings, to have bells cost £160 in St. Vigor’s and £180 in Great Wilbraham, the choir £100, the organist £70, heating £80 and a verger £20 (£40 in Great Wilbraham). We also ask for a non-returnable deposit of £30 when you first book your wedding. Q Can I choose what kind of service I want? A You can choose to have a modern language service or one in more traditional language including the Book of Common Prayer service. Talk over the options with the clergy. There are usually one or more readings from the Bible in the service - we can help you select the most appropriate. There will also be some prayers, which you may help to choose, or you may write your own. You may also decide to have someone other than the minister leading the prayers and doing the Bible readings. One of the clergy will preach a sermon during the service. If you have friends or family members you would like to involve in the service, for instance playing a musical instrument or singing a solo, discuss this with us at an early stage of your planning. Q Which hymns and songs can I have? A We can advise on suitable hymns and songs, as well as music for coming into the church, going out and during the signing of the register. If you want to set out the words and/or music on a printed service sheet, you will need to comply with the copyright laws – we can tell you more about this; and we can give you a small booklet full of suggestions for appropriate wedding hymns and songs. We also give couples a special marriage pack when we first meet you. This includes all sorts of bits and pieces to help you make your plans. Q Should we have one or two rings? A A wedding ring is a symbol of unending love and faithfulness, and of the commitment you are making to each other. It is entirely up to you whether you have one ring or two. Q Can we have a video recording of the service? The Bible compares married love with the love Jesus has for his followers. He expressed his love by being prepared to sacrifice himself, even to die for the people he loved. This is amazing, unconditional love. Jesus never said 'I love you, but …'. In our marriages we can try to follow his model by loving our partners in a self-sacrificial way, putting their needs before our own. Most people are familiar with the marriage service. The couple traditionally arrive separately, the bridegroom first with his best man, and the bride, at the appointed time, led down the aisle on the arm of her father or a close relative. The groom's family and friends sit on the right and the bride's on the left. Bride and groom meet at the chancel step. The Minister prays for the couple and declares the purposes of marriage before asking, as the law requires, if anyone knows any reason why the marriage should not take place. Next come the questions. Will you love, comfort, honour and protect...and, forsaking all others, be faithful as long as you both shall live? Each is asked and each answers, "I will". Turning to each other, bride and groom then make the age-old vows, little changed for more than 800 years... "to have and to hold, from this day forward, for better, for worse, for richer, for poorer, in sickness and in health, to love and to cherish till death us do part, according to God's holy law." By giving and receiving the wedding ring or by exchanging rings, the couple complete their promises. The priest proclaims them husband and wife and pronounces God's blessing on them. After the register has been signed (this is a legal requirement), the congregation prays for the couple, asking God's help for them as they begin their new life together. A wedding is one day - a marriage is a lifetime You have probably already spent many hours planning your wedding. There are so many things to think about - the dress, the cake, whom to invite, the honeymoon. All of these are important, but the wedding is just one day, while marriage should last for the rest of your lives. Each year, we run a one-day course for couples planning to marry during the following year. It provides an opportunity for them to explore some of the spiritual, emotional and practical aspects of life together.